The most common way of establishing who owns land or for example a boundary fence is to look at the title deeds. Usually there will be a clear demarcation of who owns which part of the land and boundaries. It is however sometimes possible for the original owners of land to lose their ownership due to another party's adverse possession of it. Essentially adverse possession is where someone who is not the owner of land possesses (has sole use of) it. This land may be owned by Farmer B according to the title deeds, but Farmer A has had sole use and possession of it for a lengthy period. Ownership of the land has therefore transferred to Farmer A due to adverse possession. When does adverse possession exist? I have owned my property for over 25 years. There is an existing fence line put in when the plots were separated in the early 70s. The fence is concrete and wire. I've used and maintained the land and retaining wall to the right of these concrete posts for the past 25 years. Our neighbours now want to enforce the legal boundary and move it effectively further towards the right, claiming the land and wall we have been maintaining. Can they do this or have do I have rights under adverse possession? The test for adverse possession (as confirmed by the House of Lords in J A Pye (oxford) Ltd v Graham) ) is whether the trespasser has possessed the land for the requisite period. An application to the court for adverse possession is only recommended where the party taking possession does not have an entitlement to neighbouring land. If the party taking possession has rights to a neighbouring land (like Farmer A above), whilst they may have adverse possession, the application that should be made to the court is one to simply alter their and their neighbour's title plans to show the new boundary. I have a four foot border at the side of my property and have exclusively used this as a flower bed for 27 years. New neighbours have moved in and have claimed that the strip is part of their property. They are demanding that it is returned to them. What can I do? Eg: Going back to our example above, the adverse possession by Farmer A commenced 20 years ago. The right to claim existed after possession for 12 years, so 8 years ago. Farmer A has 12 years from when the right to claim existed to actually make a claim, so now has just 4 years left. * There are slightly longer periods for government departments or spiritual organisations taking adverse possession, along with other specific but rare scenarios. The process of making either of the above applications can be tricky, and your claim will be rejected if the forms are not completed correctly and relevant supporting evidence not provided. It is therefore recommended that you contact a lawyer if you are considering a claim for adverse possession; this is an extremely complex area of property law with plenty of exceptions, loopholes and technicalities! i have a strech of land to tge side of my house, i have hinted to my neighbours about detecting a fence half way through the land deviding it. my neighbours have said they woukd be happy to maintain the side closer to them providing they will be allowed to let the dog run free. would my neighbours be allowed to take possession if i did this? Regards to the below message, Planning permission has been granted since April this year by the way. My neighbours have been round. The lady has stated that she legally owns the fence that separates our rear gardens, and also the land it sits on. As far as I can see on my deeds, the land the fence sits on is mine. My boundary line shows a straight line from the right side of my property all the way to the rear fence. Apart from the fence not being very straight and encroaching on my garden, it is attached to the rear wall of my house. The reason this all got brought up is that I have had plans drawn up for an extension. The plans clearly show the wall of my new extension running along my boundary. I have no issue with the fence being attached to the new extension (similarly to how it is currently) and have told the neighbour this, but she is insistent that her fence is left in its current location and that I need to build my wall 100-150mm in from the legal boundary line to accommodate this. I am aware that it would be fairly difficult to build along the boundary line unless my foundation is dug in the neighbours property by 100mm or so, but my plans have a stipulation on the detail that the foundation is to be 600mm (rather than the 500mm generally) wide to accommodate the edge build for the wall over the foundation. I just need to get some advice on where I stand and as to whether I can remove the 1 and a half panels in my garden so the wall can replace it. Thank you for your time in advance. We recently bought a house and only this week found out that the neighbour who is at the rear of my garden boundary has advanced about 3 meters into my garden (behind a shed), he even built a paved drive as a side entrance and put a gate on it, all within my land. The boundary on my deed clearly show that land is mine. Talking to other neighbours, this happened about 8 years ago with the (not written) consent of the previous owner of the house I bought. Can I claim the land back easily or do I need to take him to a tribunal? Thanks. I moved into my property 8 years ago and last year wanted to build a new driveway with brick walls on either side. My neighbour on the left of me looking at the road objected me to take down an old wall that is thereso I build my new wall next to this old wall on my side. He kicked down some the new wall, so I got a surveyor to do a report and shows that this old wall sits some one foot on my land and my solicitor sent this report to my neighbour to rectify the broken wall. He has claimed this old wall sitting on my land belongs to him but has shown no evidence to date. The HM registry plan shown a straight line on the bounday from the back of the garden to the front up to roadside. This old wall has an ugly side on my side and I believe this wall was put up by previous owners of my property , as the neighbour would not erect such a wall on the neighbours land with the ugly side facing the neighbour. if a claim for adverse posession is done by my neighbour is it just the land up to the old wall that he can claim or also the wall itself, as we are taking him to court for tresspassing and damage. What is your view. Can we for example claim the land up to the old wall is his through adverse possesion , but the wall itself is mine since it sits on my land . Just a small matter on the title deeds this wall is marked 'T' on the neighbours plans, but I still insist that it has been built by my house previous owners for the reasons above. This wall is falling apart and never been maintained? Your view. The neighbour says this wall has been there for over 60 years? He is not even that age? Also he moved out of the property about 6 years ago and now after a divorce has moved in as a tenant in 2015 with the house owner in title a lady owner residing somewhere else. We recently decided to ask our neighbor if we could remove a wire fence and 4 evergreens to complete a fence between our gardens. There were already 2 fence panels installed but the fence line was continued with the trees and fence behind them. On our side there was a 3ft wide raised flower bed that the previous owner of our property must have installed many years ago. The neighbor and his son agreed to us undertaking the work and we have asked for no payment from them. Our builder began putting the panels and posts in but when he returned to add the final 2 panels the neighbors daughter appeared and stated that the fence was in the wrong position and that the boundary line was wrong from the top of our garden right past 2 houses (her father's being the 2nd one) she provided the builder with an OS printout that indeed shows the fence starting about 2 ft further into our side of the land in line with a brick wall of another property, however at this point there is a 20ft high tree that must have been there for many years. She stated this was their deeds but the house highlighted in the printout was our property which stands on a separate plot of land. (Our property and garden are separated by a dirt track and on separate deeds).My question is although we have only owned the land for 7years would the existence of both the flowerbed and well established tree be enough to claim adverse possession? There is also the evidence that there were already 2 fence panels in existence. If we hadn't of removed the evergreens that provided the boundary the daughter would never have raised this as an issue. You may be able to apply on the basis of use by predecessors but you should consult a legal professional, do not take our word for this. We recently decided to ask our neighbor if we could remove a wire fence and 4 evergreens to complete a fence between our gardens. There were already 2 fence panels installed but the fence line was continued with the trees and fence behind them. On our side there was a 3ft wide raised flower bed that the previous owner of our property must have installed many years ago. The neighbor and his son agreed to us undertaking the work and we have asked for no payment from them. Our builder began putting the panels and posts in but when he returned to add the final 2 panels the neighbors daughter appeared and stated that the fence was in the wrong position and that the boundary line was wrong from the top of our garden right past 2 houses (her father's being the 2nd one) she provided the builder with an OS printout that indeed shows the fence starting about 2 ft further into our side of the land in line with a brick wall of another property, however at this point there is a 20ft high tree that must have been there for many years. She stated this was their deeds but the house highlighted in the printout was our property which stands on a separate plot of land. (Our property and garden are separated by a dirt track and on separate deeds). My question is although we have only owned the land for 7years would the existence of both the flowerbed and well established tree be enough to claim adverse possession? There is also the evidence that there were already 2 fence panels in existence. If we hadn't of removed the evergreens that provided the boundary the daughter would never have raised this as an issue. It's unlikely the council will be able to help with this unless the rear structure is beyond the permitted development limits. Unfortunately, if you cannot resolve this amicably, you may need to consider using a mediation service or taking legal action. I am disgusted that someone can deliberately set out to deceive and claim land as their own when other people have bought and paid for it. And the law let's them! Why haveboundaries and land registry if the law works for the illegal occupier.What happened to honesty andhonour. If the fence has been in place/the neighbours have been using the land for over 20 years then yes, they may have a claim for adverse possession. Hi, I have owned a now derilict house for 2 years on a large plot of land. I have just recieced planning approval to erect a single residential house for us to move in to. The land registry shows a piece of land at the bottom of my garden that is not defined as owned by either my neighbour or myself. This piece of land has been fenced off and maintained by the previous owners of my house who lived there for over 60 years and then by my gardener. My neighbour has looked at the land registry document and decided he should own this land (possible land grab). He has removed the original fence and put up his own fence, thus adding this area to his own garden.I have spoken to this neighbour who feels he is in the right. I am sure I have adverse possession but would like clarity; but also do I have to take him to court or can I tear down his fence and erect my own after giving him notice. Any advice would be appreciated. You neighbour cannot claim adverse possession if they have only just fenced off and started "using" this land. There a possibility you can rely on adverse possession by yourpredecessor as they were in effect in adverse possession for 60 years and so should have claim to the title.You should seek professional legal advice before proceeding with any course of action. We have a school on the back of our property. More than 10 years ago they erected metal fence about a meter into thier land. That created a corridor with no access. But about 7 years ago neigbours removed mature hedge at the end of thier garden and erected thier fence in line with our. So now we got a corridor ending behind our tall outbuilding with entrance from school. It was full of litter as kids made a nest there. But recently we found syringes. the police came to advise that people were seen getting over fences at the back of our garden. We had robbery in our garage worth £400. So we bloked that corridor were our property starts. That gives us about 4 sq m of school land. School manager then tried to break in. We thought that was done by these doggy visitors and fixed the fense properly by a metal barrier. Then that school manager came at our door demanding we remove the barrier. We explained the security concern, poluce advise and refused to let this corridor to threaten our security in future. The school manager said we could eventually get the right to that land. Well. All they need to do is to move thier own metal fence back to thier bondary. We never heard back from them. I wanted to buy that land from council. Now we just need to establish when metal fence was build and get it for free. Hopefully the above article explains adverse possession effectively enough and how to apply for it? We have a school on the back of our property. More than 10 years ago they erected metal fence about a meter into thier land. That created a corridor with no access. But about 7 years ago neigbours removed mature hedge at the end of thier garden and erected thier fence in line with our. So now we got a corridor ending behind our tall outbuilding with entrance from school . It was full of litter as kids made a nest there. But recently we found syringes. the police came to advise that people were seen getting over fences at the back of our garden. We had robbery in our garage worth £400. So we bloked that corridor were our property starts. That gives us about 4 sq m of school land. School manager then tried to break in. We thought that was done by these doggy visitors and fixed the fense properly by a metal barrier. Then that school manager came at our door demanding we remove the barrier. We explained the security concern, poluce advise and refused to let this corridor to threaten our security in future. The school manager said we could eventually get the right to that land. Well. All they need to do is to move thier own metal fence back to thier bondary. We never heard back from them. I wanted to buy that land from council. Now we just need to establish when metal fence was build and get it for free. Our garage at the rear of our terraced property and our deeds showing marked in yellow right of way for car and pedestrian for all time. The property is leased and sub leased. We can access the garage going through the house butonly drive through the right of way. Although we seldom use the garage for the car we still wish to keep our right of way, otherwise the garage would just be a huge shed. Our neighbours along the row have surrendered their rights on the basis that the new landowner will remove rubbish from the land and then landscape. The landowner wishes to extend his huge garden. He also says that solicitors involved will be very costly for us and he is a banker so I don’t think cost involved worry him. My shed was erected by previous owners over 20 years ago. New neighbours last year said the roof overhang is over the boundary and have erected a summerhouse/shed next to it and extending to 5.75 M. I said if that is true my shed has earned and now owns that airspace by easement.Neighbour has not installed any guttering but thinks that to let the roof overhang mine and let the rain gush over onto my shed roof felting is perfectly OKThey have left no air-flow space between his and mine and as the sun and wind comes from their direction my shed is already all green with algae, including my pond bridge. Thus causing premature rotting.Now it is winter, the structure puts all the width of my rear garden in the shade and is too dangerous to walk on as is like a soggy bog and slippery. His garden is built up so his shed is much higher than mine.How do I complain? He is using the guise of Permitted Development - in a conservation area- and employing a private inspector. so council not involved.Despite renewing the shed roof felting 3 years ago, the electrical sockets tripped the house sockets the night of the storm recently. If you think the neighbour's summer house falls outside permitted development obviously contact your planning department. With regard to the airspace issue, firstly check the exact boundary - the deeds might depict these (although note, many deeds are not that accurate). There is unlikely to be any mention of a "right" to the overhang of a shed which wasn't there at the time the property was constructed so that will not be of any use to you. On properties overhanging gutters that have been there for over 20 years can sometimes give the owner "acquired prescriptive right" for them to be there but again, this might not apply to sheds. Adverse possession of the land/airspace occupied by the gutter is another avenue, but you have to apply to court to claim adverse possession (if the land/airspace has been used for over 12 years). You should seek professional legal advice. My shed was erected by previous owners over 20 years ago.New neighbours last year said the roof overhang is over the boundary and have erected a summerhouse/shed next to it and extending to 5.75 M.I said if that is true my shed has earned and now owns that airspace by easement . Neighbour has not installed any guttering but thinks that to let the roof overhang mine and let the rain gush over onto my shed roof felting is perfectly OK They have left no air-flow space between his and mine and as the sun and wind comes from their direction my shed is already all green with algae, including my pond bridge.Thus causing premature rotting. Now it is winter, the structure puts all the width of my rear garden in the shade and is too dangerous to walk on as is like a soggy bog and slippery.His garden is built up so his shed is much higher than mine.. How do I complain? He is using the guise of Permitted Development - in a conservation area- and employing a private inspector. so council not involved. Despite renewing the shed roof felting 3 years ago, the electrical sockets tripped the house sockets the night of the storm recently. I have recently had new neighbours, who removed the originalwall that adjoined the two properties not attached to our building, ( although our deeds show a "T" which says he has the rights onhis side )the neighbours front dooris set back from our property, so it shows a clear divide from the end of our house to his.He removed the original wall without permission including bricks from the front wall of our house and placed them on our land, he replaced with a fence a lot higher and has drilled into the front of our house 3 big bolts (without warning or notice) which has caused internal damage to our inside wall.On approaching him he said that the wall was a double cavity wall and the outside of the wall belonged to him and that he owned it , including one side of our chimney which he seems to think as its on his side he owns also, (although he has a separate chimney the other end and does not share our fireplace.. We need to render the front of our house but cannot get to the front of our property to do so as the fence is in the way and does notallow us access ? can someone advise what i need to do please ? As I have heard lots of horror stories about loosing our property if we start legal procedure. Am I entitled to ask him to show us proof of ownership as our deeds do not show an exact area only measurement of land , which we have measured it all seem to belong within our area ? Advise would be greatly appreciated before we end up spending lots of money and start the ball rolling. My neighbour removed posts that I had left as a boundary marker between our gardens. However there is on still in place attached to corner of my bottom fence. He is denying he removed them and has encroached over my boundary with his patio. What can I do about this. If you can't resolve it between you, you may have to resort to a civil action via the courts. My neighbour removed posts that I had left as a boundary marker between our gardens. However there is on still in place attached to corner of my bottom fence. He is denying he removed them and has encroached over my boundary with his patio. What can Ido about this. I have lived in my property since 2001 and my original neighbours had already built a rear conservatory which had to be built on a base 1.2 metres high as the houses all have cellars and steps up to the kitchen doors.This, I think should have had planning permission because of the height but was never sought.Also, it was built abutting up to and over a wall between our properties and the garden fencing which belongs to this property - it states it in the land registry which I discovered at a later date. However, being a single female, I was and still am intimidated by them and it was already built and I bought the house knowing the conservatory was there.Then new neighbours moved in and they subsequently removed the frosting from the overlooking conservatory windows and I told them that they were not allowed to overlook me but they just ignored me.I then proceeded to put up a screening fence, inside my boundary to block their view and it has been erected since 2011.Now new neighbours have moved in, they have demolished the conseratory, and built a terrace over the base.In doing so, they have removed one of my fence posts to erect a balustrade and they seem to have paved right over the wall onto my property, albeit a few inches, making a shelf, 1.2 metres high.I have told them that my fence is not the boundary, but the wall but these neighbours too have told me to get a solicitor.I am now removing the screening fence to see how far over they have actually paved and also as I don't want it to be there any longer in case it is construed as a boundary.What I want to know is this, do I have the right to remove their paving/balustrade posts if they are on my property or do I need to see a solicitor first? No-one from that property has put in a claim for adverse possession of the wall and it they did can I object and win as it clearly states in the land registry that the wall and fencing belong to me. 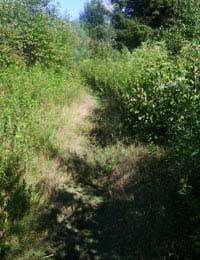 I have been living on my property over 33 yrs and my access road was throught the neighbor land. What rights do I have since I have noticed the neighbor ere ting a fence? We purchased our property in 1986. The house is mortgaged, and on one set of deeds, but the garages to the rear were on separate deeds and we purchased them outright. The garages were part of a plot of a house and garages in the street behind ours.The owners of our house owned the garages and house. In 1978 the owners split the plot,they retained the garages but sold on the house to the tenants who lived there. The land registry shows the boundary between the garages and house as a straight line. In reality though, I am assuming because of the tight access to the garages from the road, the boundary fence between the concrete hard standing in front of our garages and the front of their house, is actually about 2’ over from the corner flank wall of their of house onto the front wall elevation of their house. We have photographic evidence which is dateable to 1990 of the position of the fence. It is as it was when we purchased the property. The house has had several owners over the years but the present owner , since 2007,has just decided the fence should follow his flank wall and has told us to relocate the fence. Can we just apply to the land registry to make a change boundary as an addition to the title deeds based on the length of time we can prove this strip of land has been in our possession and used by us, or do we need to go down the route of adverse possession. I own a property in Texas, recently I found out that my neighbor is about 4 feet into my land. There was an existing fence, but the fence is not on the property line as described on my deed. I have lived here for 12 years,the neighbor moved about 7 years ago. By adverse possession, is the land his? Can I reclaim it. We can only really comment on UK related issues unfortunately - we do not know whether other countries' laws are the same as ours.